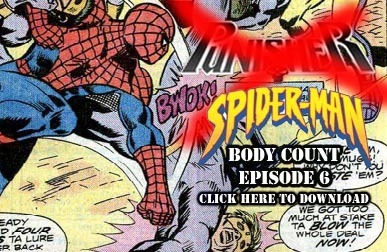 Welcome back to Episode 6 of Punisher Body Count, where the deaths keep coming and the points don’t matter! In today’s podcast, Jacob has accomplished a goal that will surely ascend him to the valhalla of nerdom any day now. After he lords his victory over us, we move on to Mail Call and I make an heart-felt apology. Then we go into a new sub-segment called Rapid Fire and answer questions from 4chan’s /co/. Then we get into Greg Rucka’s Punisher #2 in Bullet Points, where we make some dark predictions and talk about how pretty Frank is. Afterwards, we progress into Flashbacks where we discuss Spider-Man #161-162, with special guest Nightcrawler! In it, we learn that Spider-Man is the true monster and when we learn who the villain is, we find out the true victims are the readers. Finally, we spiral into our personal B.S. in Discharge Papers, where we discuss artistic liberties vis a vis cowboys and tommy guns. Keep the messages coming, and if you’d like to come on the show with us, contact us and we’ll make it work. To subscribe directly, use our RSS feed. You can also subscribe to us on iTunes.